Keep those feet warm! Thin, form-fitted construction for an easy fit with existing boots. 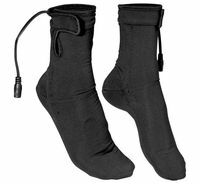 Firstgear® Heated Socks plug directly into the Heated Pants Liner or alone via our extension cable to your Heat-Troller™.